Here is my first post - some photos from trail-breaking. The basic of this activity is scooter driving on the track (if there is any). If there is no track, look forward, if there is some stump or unfrozen water ahead. First ride of the season is usually quite unpleasant thing to do. Trying to remember where the tracks were last year, crossing creeks with little fear that the ice isn't strong enough (sometimes really isn't, than it gets quite nasty I must say, especially in very low temperatures:), getting stuck every few meters in soft snow without any harder part under (except ground full of big stones, etc). If you drive offtrack with one ski, scooter could start flipping to the side, rapidly slowing down and than stopping for good. 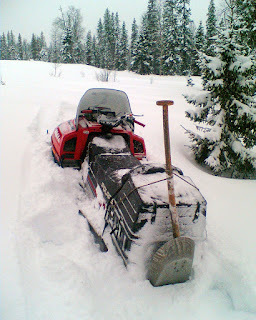 It's really wonderful to dig out our 320kg (cca 705pounds) snowmobile from the wet snow, which is something like strong and heavy glue, filling whole area inside the belt and freezing in less than hour to one piece of ice. It sticks to the shovel every time you use it, so it's almost impossible to throw anything away. That's all for this time, I am sure that I will post more pictures some other day.